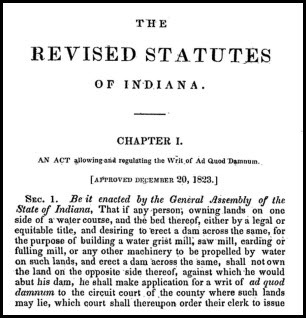 In 1838, at the end of its 22nd session, the Indiana Legislature authorized and published the Revised Statutes of the State of Indiana. And the very first law in this very early set of statutes is one that has even The Legal Genealogist shaking her head. Despite the fact that I love law books — and love to poke around in them before heading off to an area to speak, the way I’ll be speaking Saturday, the 24th of October, at the Indiana State Library’s Genealogy & Local History Fair — the fact is, this statute stopped me in my tracks. I mean, really. We all run into the Writ of Ad Quod Damnum every day, don’t we? Well, actually… we do. We just may not realize that’s what it is when we see it. Not particularly helpful, is it? Here’s the deal: one of the primary functions of early governments was to develop natural resources and make sure people were fed. They needed things like grist mills and saw mills and things of that nature that had to be propelled by water. But if somebody was going to dam up a water course to harness the power of the water, chances were pretty good that somebody else was going to suffer some damage. Sometimes the guy who needed the water didn’t own the land on the other side of the stream where part of the dam would have to be built. Sometimes somebody else would be flooded by the overflowing water. And, sometimes, there were already enough mills and dams around so that the proposed use wouldn’t be a good one — of public utility in the language of the law — at all. And figuring out how much land could be taken, how much a landowner should be paid for the damage, and whether the use should be allowed at all required something a lot more formal than just two people sitting down together to try to settle things. Especially if it really was something the community needed, and the adjoining landowners didn’t want it anyway. The NIMBY principle — Not In My Back Yard — isn’t something new. That formal procedure is what the Writ of Ad Quod Damnum was all about. It was a system for the person who wanted to use the water power to force the neighboring landowners to let him do so, if it was in the public interest, and if he compensated those neighbors. You’ll see this sort of thing quite often in court records, when a county court or board of commissioners was authorizing someone to build a dam or a mill. A jury will be chosen to choose the land to be used — and to fix the value of the land taken. The order book may not use the words, but that’s what it is: ad quod damnum. And that damned writ saved a lot of damned trouble, to be sure. Kentucky’s laws are the same. They just added damage to the orchards and mansions. I chuckle over the latter. I published an extensive book on the water grist mills & specialty mills of the area where I live and was actually able to find a lot of the ad quod damnuns (and how they did spell that!). It is a fascinating study when one realizes how important the mills were to the early citizens. Interesting to see the origins of what is often called the Public Service Board now, as it is in my state. Pretty much the same thing, only now the concerns are often power plants, transmission towers, windmills, and pipelines. I like very much your descripton about how such a board (or jury) should function in the public interest. And, I imagine much like our ancestors, we get worried that somebody with a bit more power or money or influence will overtake their less well-endowed neighbors. I say this after having responded to several alerts from groups concerned about modern versions of the dam and how they might impact our community. Wrote a couple letters of support, and one of hesitant disagreement. Wish I had the answers. I’m afraid our PSB is one that has lost a good sense of what “public good” means. In colonial Virginia, as the Legal Genealogist no doubt knows, ad quod damnum was also a legal means of docking an entail (or enforcing one), as a suit of ejectment, and f run into one of them, you might be in for a wild ride. First, some great genealogy can come out of this by virtue of who inherited what land and how, but some of the parties are fictitious. And it could possibly end up quite badly for everyone except the legal heir at law. Just sayin…at least in Virginia is could quite well mean a lot more than the taking of a trifling half acre for a mill site. Colonial North Carolina was the same: the ad quod damnum process was specifically authorized for small entailed parcels (though it may well have been used for more wealthy landowners as well). Remember, of course, that entails were disallowed by law as of the Revolution. And that ejectment was a very different beastie, altogether. Well and yes and no. But that’s another paper.